Castle Vardulon: Is Medium Screwing With Me? It's a simple enough equations Father's age (F)/3 = Son's age (S). For the equation to be true S+15 must be equal to (F+15)/2. But as far as I can tell, that doesn't work for any of them. Now, to be fair, those last two were awfully close to half, but neither was actually there. So is this just utter gibberish someone threw together as a prop in five minutes, or have I forgotten how 'math' works? Well, the first problem is that none of the ages given for the father are neatly divisible by three, but age is typically expressed as an integer, not a real number. 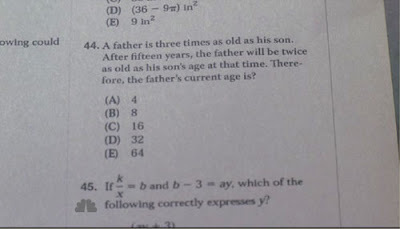 Looks to me like the correct answer should be F=45.